Company Name: Shiraishi Iron Works Co., Ltd.
Shiraishi Iron Works Co., Ltd. was established in 1961, located Kitakyushu City in Fukuoka Prefecture. 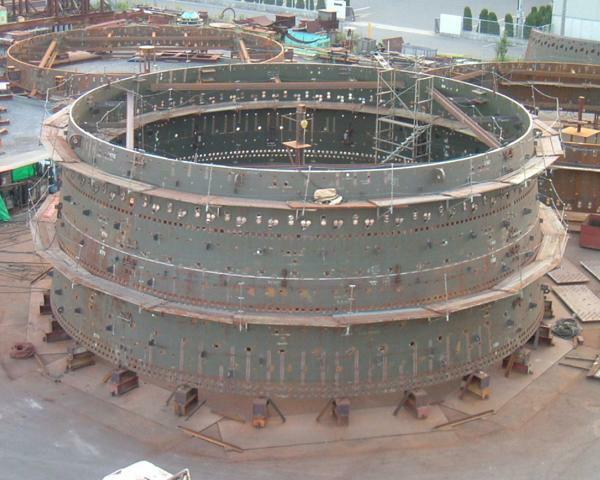 We are developing a wide variety of tanks such as spherical tanks, LNG tanks, blast furnaces, and chimney pipes. We have special technique for bending ironware to certain shapes and also have large factory for building the complicated structures of big buildings. We offer on site construction, manufacturing, and partial spherical tank design, LNG, tanks and gas holders for energy storage facilities. We also have experience in repair (renewal) work of existing tanks. Spherical tanks are highly resistant to pressure making them suitable for storing high pressure materials. Compared with other tank shapes, it is also possible to reduce the thickness of panels and cut the cost of other materials. These tanks are built to hold city gas, LPG, ammonia, oxygen, nitrogen etc. 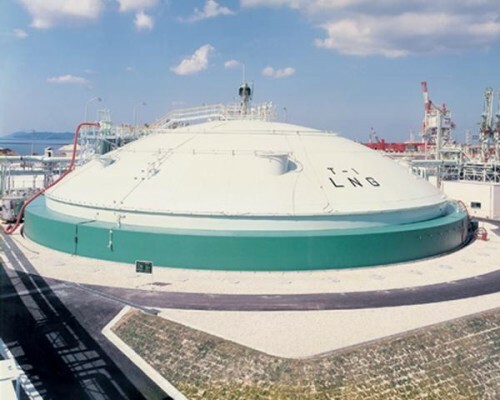 Because the natural gas becomes the volume of about 1/600 in the state of the gas when it liquefies at the low temperature, the tank where the natural gas is stored at the low temperature can compactly store a large amount of natural gas. To keep low temperature of -162℃, the tank has double-shell structure that has a refrigerated layer sandwiched in the middle. These are common cylindrical tank shapes. The roof of Corn-Shaped Roof Tank is a circular corn shape, and the Dome Roof Tank is domed shape. Maintenance is also comparatively easy and the tanks can be used to store various fluids such as heavy fuel oil, water and light diesel oil. We offer customers checks for existing tanks and offer plans for repair. We offer complete service from manufacturing to on-site work to repair the floating roof of a FLOATING ROOF TANK, including replacement of corroded side or bottom panels of a corroded tank. Only a building overflowing with originality can breathe fresh air into the landscape of a town. We will help you to make your imagination real. This panel material is made of light weight steel. Its dimensions are approximately 5m horizontal × 5m vertical weighing approximately 500 kg. With about 2100 panels, the total weight is more than 1000 tons. Because each panel is different in shape and demission, a high degree of materials management and skill is required for manufacturing and field erection work. Designed by Mr. Alehandro Zaera Polo and Mr. Farshid Moussavi who won the Yokohama Ferry Terminal Competition in Yokohama City. Structural steel, first basement level・second floor above ground, gross floor space is approximately 35,000 square-meters. We conducted the onsite shop fabrication and building of Shotaro Ishinomori’s Memorial Museum “Ishinomori Mangakan Museum”. Shotaro is famous for his works such as “Cyborg 009″ and “Masked Ryder” in Ishimaki-City, Miyagi Prefecture. This egg-shaped building was created from a blend of canning and iron frame techniques. 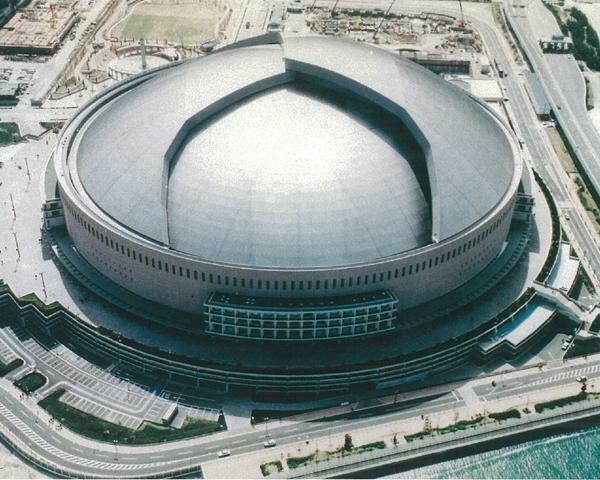 It is called Ohmi Comprehensive Center, commonly known as “Ran-Ran Dome”. It is 31 meters long and 17 meters high with a two-storied main hall that has outclassing acoustics. We are engaged in furnace manufacturing including mantels which are often the symbol of steel plants, furnace tops, dust eliminators and air-heating furnaces. In addition we also conduct renovation work as well. This is one of the most important facilities of steel plant. We make every effort to produce the best products, assembling the best canning techniques and other specific bending and cutting works. We manufacture air-heating furnaces and other facilities ancillary to the main body of the blast furnace. To prevent gas leakage, advanced fabrication and welding accuracy is required. We create and install high-rise steel structures such as chimneys and wind electricity towers, wireless iron towers and panel lights. 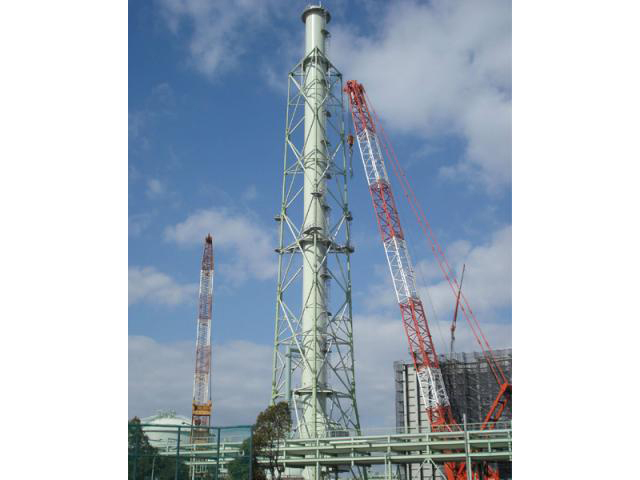 We manufacture high-rise chimneys between 150 meters to 200 meters high with high level dimensional accuracy, by using our steel plate bending techniques which have been cultivated over the years. Single items and assembled block parts made at the fabricating lab will be carried and assembled at the construction site. Please check other product lines.